Free delivery on orders over £39.99. These window baskets are from the Classic Range. Made from steel strip and rod construction. These window troughs are finished in black coating for long life. This window box comes complete with coir basket liner. These window baskets are from the Esk Range. Made from steel construction. These window baskets are finished in black coating for long life. This window box comes complete with coir basket liner. 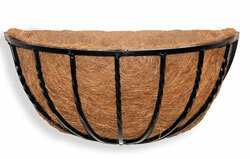 This range of hayrack are made from solid steel rod to make a traditional looking wall basket. These flower baskets come complete with co-co liner. PVC coated steel for protection against weather conditions. These window boxes are from the Georgian range, offer great value for money. These window flower boxes are made from rod and strip construction. Strong welded joints. These windowboxes have a durable black wrought iron crackle finish. These flower baskets have a quality co-co liner included in with the price. More Planters, plant pots, garden pots, hanging baskets, window planters and hayracks available to purchase. Size: 20" (50cm) wide x 10" (25cm) high x 10" (25cm) deep. Size: 24" (60cm) wide x 7" (18cm) high x 7" (18cm) deep. Size 24" (60cm) wide x 7" (18cm) high x 7" (18cm) deep. Size 30" (75cm) wide x 7" (18cm) high x 7" (18cm) deep. Size 36" (90cm) wide x 7" (18cm) high x 7" (18cm) deep. 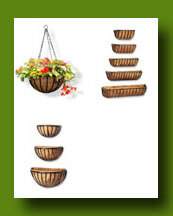 See the matching wall troughs, wall baskets, hay racks, 2 tier fountains, patio troughs and cradle planter in this range. These iron window boxes are from the blacksmith range. These window flower boxes are from our heavy duty wrought iron look range. Made from solid rod and square section steel construction. Distinctive barley twist decoration. Strong welded joints. These windowboxes have a tough epoxy coating for durability and the wrought iron look. These flower baskets have a quality co co liner included in with the price. More Planters, plant pots, garden pots, hanging baskets, window planters and hayracks available to purchase. Size : 60cm (24") wide x 7" (18cm) high x 7" (18cm) deep. Size : 75cm (30") wide x 9" (24cm) high x 9" (24cm) deep. Size 48" (120cm) wide x 7" (18cm) high x 7" (18cm) deep. These Hand forged window flower boxes are made in Great Britain from heavy duty steel. This iron window box is engineered to the finest standards. These flower baskets features hammered finish rims and decorative, twisted front bars. This windowboxes comes complete with liner. All these garden planters are powder coated to ensure long lasting looks. Classic design will enhance any garden. Also available to purchase wrought iron window boxes, hayracks, hanging baskets, planter boxes and plant pots. 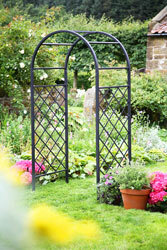 These Hand forged window flower hayracks are made in Great Britain from heavy duty steel. This iron hayracks is engineered to the finest standards. These flower baskets features hammered finish rims and decorative, twisted front bars. This mangers comes complete with liner. All these garden planters are powder coated to ensure long lasting looks. 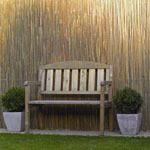 Classic design will enhance any garden. Also available to purchase wrought iron window boxes, hanging baskets, planter boxes and plant pots. 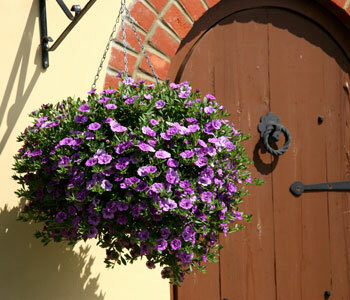 See the matching Hand-forged wall baskets, hanging baskets, window boxes. This metal wall trough has a classic intricate designs in an elegant verdigris finish. 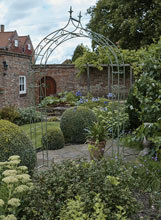 These flower troughs are a distinctive arched wire and punched metal design for timeless style. These flower window boxes are extra deep for good plant growth. This wall troughs comes with a Co-co quality liner. Size: 60cm (24") wide x 23cm (9") high x 20cm (8") deep. This metal wall basket has a classic intricate designs in an elegant verdigris finish. These flower baskets are a distinctive arched wire and punched metal design for timeless style. These flower window baskets are extra deep for good plant growth. This wall basket comes with a Co-co quality liner. Click here to see larger image of wall basket. These wall pot planters are from the Signature Collection Nature Range. This wall planter is made from ustic iron with bird and leaf design. The plant pots are removable for easy planting. We also have 9 other pieces in this signature range design. These wall pot planters are from the Signature Collection Versailles Range. This wall planter is made from steel and finished in a bronze effect. The plant pots are removable for easy planting. We also have 10 other pieces in this signature range design. These wall pot planters are from the Signature Collection Loire Range. This wall planter is made from steel and finished in a white-grey wash finish effect. The plant pots are removable for easy planting. We also have 9 other pieces in this signature range design. These stunning flower boxes in the Country Forge range are handcrafted. The flower planters are manufactured in the style of the traditionally forged products. The window boxes feature extra thick bars and rims with deeper proportions for a more old fashioned feel. The flower mangers come complete with natural liners. For lasting looks and durability the window mangers are powder coated. The extra deep proportions allows better plant and root growth. Help reduce your carbon footprint, buy British. Available in three sizes. 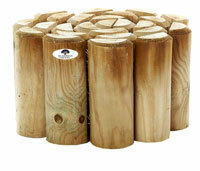 This stunning flower manger in the Country Forge range is handcrafted. The flower planter is manufactured in the style of the traditionally forged products. The flower hayrack features extra thick bars and rims with deeper proportions for a more old fashioned feel. The garden planter comes complete with a natural liner. For lasting looks and durability the hanging basket is powder coated. The extra deep proportions allows better plant and root growth. 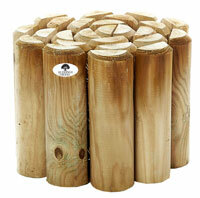 Help reduce your carbon footprint, buy British. These Spiral Hand forged window flower boxes are made in Great Britain from heavy duty steel. These spiral window boxes have a spiral finials. This spiral iron window box is engineered to the finest standards. These flower baskets features hammered finish rims and decorative, twisted front bars. This spiral windowboxes comes complete with liner. All these spiral garden planters are powder coated to ensure long lasting looks. 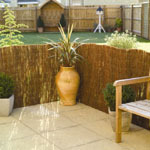 Classic design will enhance any garden. Also available to purchase wrought iron window boxes, hayracks, hanging baskets, planter boxes and plant pots. 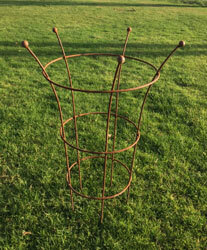 These Spiral Hand forged hayracks are made in Great Britain from heavy duty steel. These spiral hay racks have a spiral finials. This spiral iron hayrack is engineered to the finest standards. These flower baskets features hammered finish rims and decorative, twisted front bars. This spiral hayrack comes complete with liner. All these spiral garden planters are powder coated to ensure long lasting looks. Classic design will enhance any garden. Also available to purchase wrought iron window boxes, hayracks, hanging baskets, planter boxes and plant pots. A traditional styled wall trough to create a large impression. These window boxes are manufactured from metal sturdy enough to support significant planting, you could build a silhouette of peaks and troughs with plants of different heights. These Traditional window baskets come with good quality liner included. Made from heavy-duty solid metal rod with powder coating to give long-life. Size: 60cm width x 21cm depth x 21cm height. A traditional styled window box to create a large impression. These window boxes are manufactured from metal sturdy enough to support significant planting; you could build a silhouette of peaks and troughs with plants of different heights. These Traditional window baskets come with good quality liner included. Made from heavy-duty solid metal rod with powder coating to give long-life. Size: 75cm width x 21cm depth x 21cm height. A traditional styled hayrack planter to create a lasting impression. These window baskets are manufactured from metal sturdy enough to support significant planting; you could build a silhouette of peaks and troughs with plants of different heights. 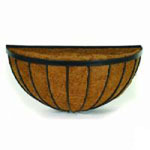 These Traditional wall baskets come with good quality liner included. Size: 40cm width x 21cm depth x 20cm height. View our new range of Victoriana planter range including window boxes and hanging basket. Please look at our range of obelisks for the garden these supports for plants are both functional and decorative all are made from steel coated with plastic coating to prevent rusting. We have a large range of size and height available of plant supports ideal to give height and impact to your garden borders and the smaller sizes of metal obelisks to fit your planters and garden pots. Please click on the image of obelisk for garden to view. 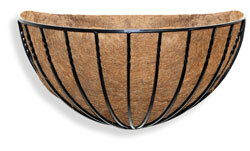 Our Coco basket liners are made from organic coir fibres. 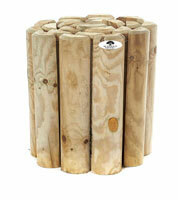 These biodegradable replacement coco liners will keep your plants healthily allowing plants to grow faster. Please click on the image of coco liner to view more.